Next week, the Centre for City Ecology and Toronto Park People will welcome Ryan Gravel, design manager for the Atlanta BeltLine Corridor, to speak here in Toronto. Ryan will speak about the power of non-partisan investments in public works projects to catalyze revitalization and will connect his experience conceiving of and planning for the Atlanta BeltLine with some ongoing infrastructure corridor projects here in Toronto. We recently posted an article on Spacing’s Toronto blog titled “The Atlanta BeltLine: Catalyst infrastructure and City Systems” that explores the BeltLine as a comprehensive public works project, and how this kind of city systems thinking could be applied to Toronto’s Green Line. As downtown Toronto faces significant development pressures, communities are increasingly looking to edge spaces and infrastructure corridors as potential open space assets, to be transformed into linear parks and railpaths. Taking notes from the Atlanta BeltLine, we should consider these projects from a city systems perspective–what is the potential for transit, active recreation, enhanced urban design, and good development along these new linear parks, and how can we harness that potential to build the Toronto we want? The article explores what this city systems perspective might bring to the Green Line, a space around which communities are already organizing to advocate for its transformation into a linear park. In a central city facing immense development pressures, the potential of the Green Line as an existing assemblage of open space to enhance our park and trail network is huge. The space could not only serve as a public linear park and recreation amenity, but also facilitate east-west pedestrian and cycling connectivity though mid-town Toronto. The Green Line could also catalyze a new type of development in the area. It could generate a new urban form along the Dupont strip, connecting neighbourhoods that have been separated by the rail and hydro corridor through built form and public realm design that stitches together both sides and establishes the open space as a focal point. It could be integrated into the City’s recent study of the Dupont Employment Lands and to the area’s overall development as a mixed use area of higher density. 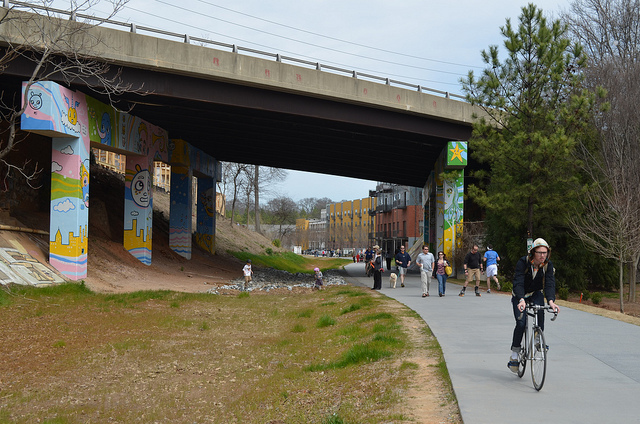 The Atlanta BeltLine considers open space, transit, movement, housing, and economic development comprehensively. This kind of systems thinking should be encouraged along the Green Line, too. Read the full article on Spacing’s Toronto blog here.